Action Squad is a jarringly different game. 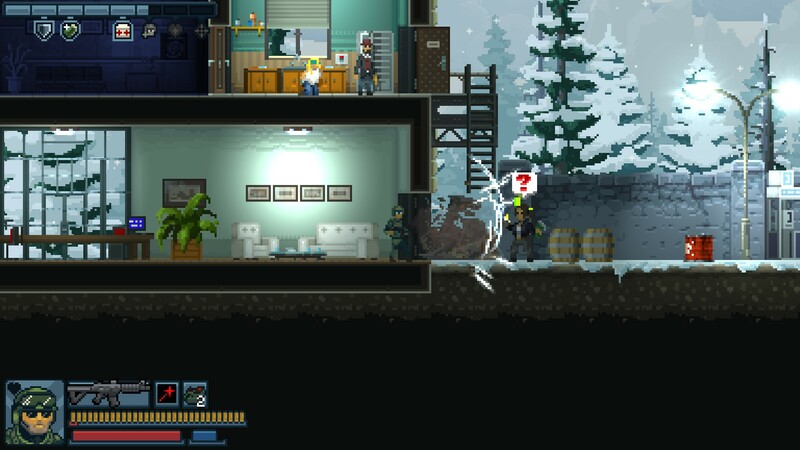 The pixel art graphics trend towards lighthearted and humorous, and the game is a lot lighter in tone. It’s like more serious, more tactical version of Metal Slug. 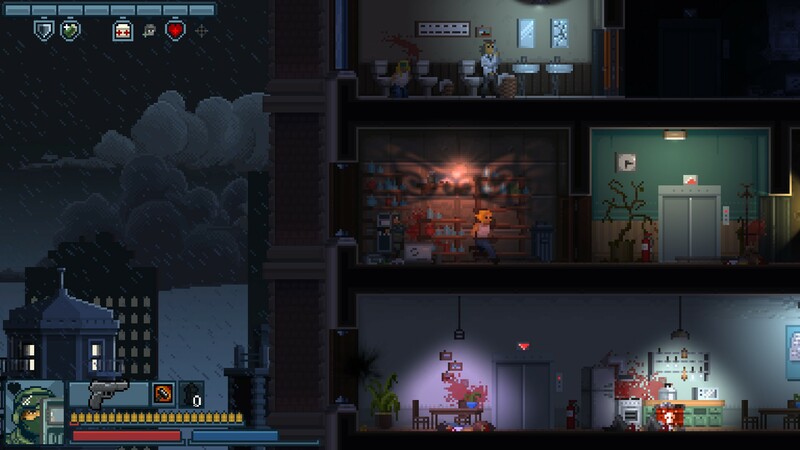 Instead of a nearly-endless sidescrolling level, you are presented with a building (or a compound). You can see what sort of enemies are hanging out in some rooms, while others are dark. So you kick the door down and put some tangos in the bag. Before you do that, you can choose one of the several character classes, each with a different play style. They’re not equal – the game actually rates how easy it is to play with them. The Assaulter gets to use assault rifles, with his secondary ability (well, the alt-fire mode of assault rifles) being an aimed shot that kills an enemy (or a hostage) in one hit. He’s an easy character to play. The Recon is the class most suited to the two-player coop, what with many gadgets that reveal rooms and give allies damage bonuses against targeted criminals. He’s in the medium range as far as difficulty goes. The Breacher has a shotgun and a single blast kills most visible perps in the room. The game rates his difficulty as “LOL.” You get where I’m going. The criminals come in several varieties, too. The basic dudes will rush you with a knife – it goes straight through the armor, so they are quite dangerous. The lowest-tier shooters carry a pistol – but even then, he’s no match for your pistol-haver classes. Right above them in threat is an SMG-totting black guy in a white wifebeater. However, the truck driver with a shotgun is probably the most dangerous of the common enemies. The deeper you get in the game, the more varieties of enemies appear – some of them are souped-up versions of the basic dudes while others employ dangerous tactics and abilities that mirror yours. But before you shoot any of them, you have take care of doors. 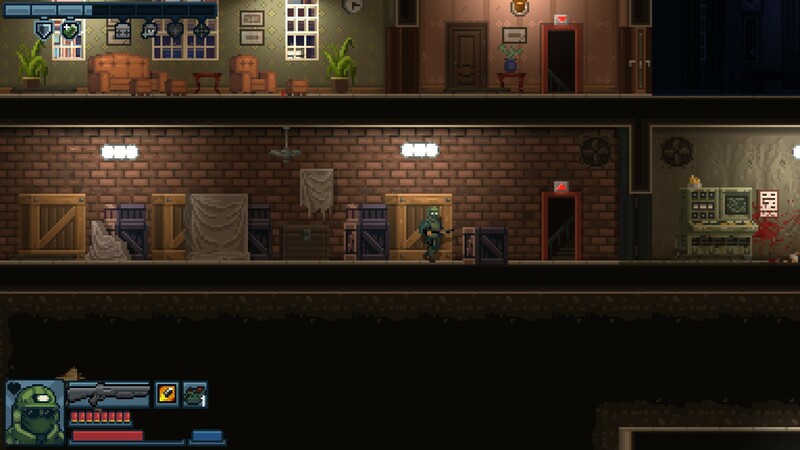 The enemies won’t walk from room to room via closed ones (but they might take stairwells). For regulars doors, you can either open them up quietly or kick them out. There are also reinforced doors – only the Recon can deal without much of a fuss. The others will have to kick them down or blow them up. There is some tactical thinking involved in choosing your approach to the noble art of door kicking. Me, I like to chuck an explosive charge on the door, kick it once or twice to alert the bandits, and then wait for them to shuffle closer to investigate. That’s how you can use the blast to both take down the door and a few of the opposition. A similar tactic is kicking the door twice, waiting for a dude to get close before kicking the door down, stunning the git. The Breacher can also shoot the door out, because he’s the best class. However, no class will ever succeed without using the Strategic bonus bar. It’s filled up as you gain points for killing perps (this is America, they don’t them alive) and saving hostages. You can cash it in for various rewards, ranging from armor refills and spare equipment (you have infinite reloads for your guns, but door explosives and grenades run out fast) to extra lives, machine guns and sniper support. It’s very much arcade-y, but such is the game. Another person freed from the hellish torment of photo-development room. As such, your will receive a rating of up to 3 stars upon completing a mission. 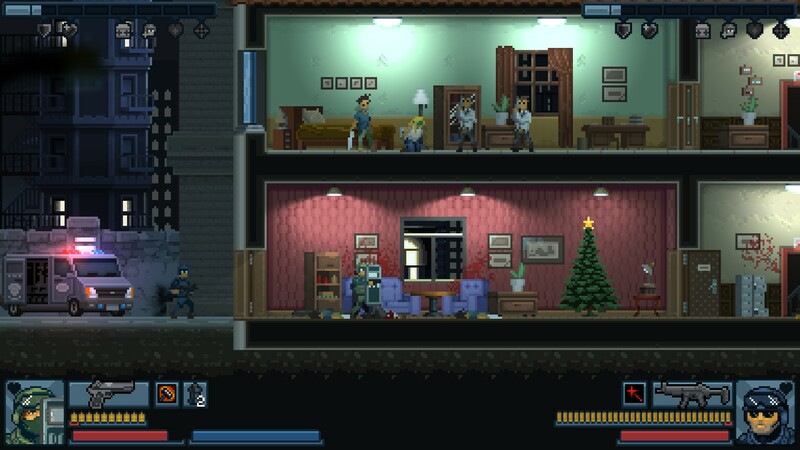 To get the max, you usually have to rescue all of the hostages in a level. Stars are then cashed in when buying gear, such as better guns, armor and equipment. Your SWAT troops get experience even if they fail a mission (read: die). Each level up gives you two skill points to spend on both class (applies to specific class) and team (applies to any class you use) upgrades. Most of them are incremental increases in accuracy and such, but some can be really powerful. The Shield troop can become a tough nut to crack pretty soon! Breach and clear with a friend! And unlike the original Door Kickers, the campaign here is pretty laid back. Think more Angry Birds – actually, it’s just like Angry Birds. You tackle missions, earn stars, and completed missions unlock further campaigns. Most popular mission format is hostage rescue (untie a hostage and she’ll dissipate into the ether/freedom), but you can run into bomb defusal, total elimination and so on. 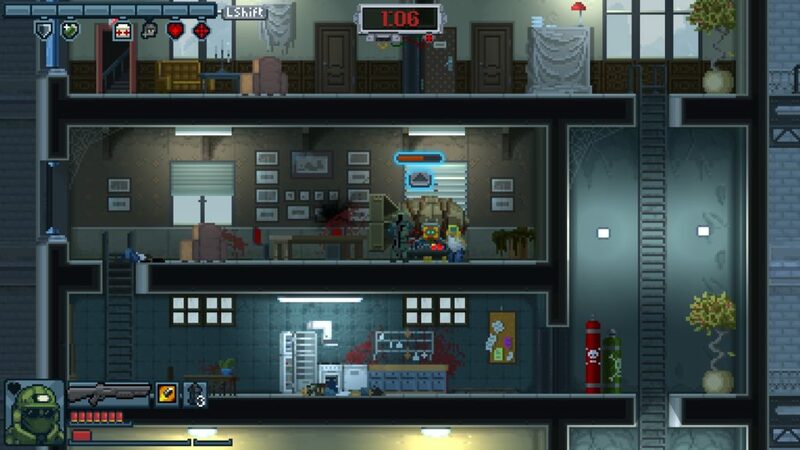 It doesn’t really matter much, since most of it is about kicking down doors and shooting dudes. However, the environmental variety is pretty great and later missions introduce new types of challenges. Overall, I enjoy the pixelart-y graphics of the game. It fits well with the tone of gleeful police violence against the types of mass criminal gatherings that only appeared in action movies in ‘80s and ‘90s. The character portraits are pretty good, the maps look fine, and the enemy types are immediately identifiable via their colors and profiles. There are also pints of gratuitous blood, which is always welcome. The audio part of the game is serviceable; it’s not annoying, and the few voice bits that your classes get are nice. One other thing: the game supports hot-seat multiplayer co-op in addition to going online. Map out that keyboard 2 layout (or get two gamepads) and invite your significant other for a spin. I have already shot some dudes after teaming up with my girlfriend. Maybe I’ll finally get to use Recon to his full potential. Door Kickers: Action Squad is a game no Door kickers player would have expected, but here it is. I like it’s mixing of fast sidescroller action and minimalist approach to tactics. Besides, the most unrealistic part isn’t the whole side scrolling combat, but the fact that you don’t shoot any unarmed black dudes.